248 pages | 3 B/W Illus. Understanding and Healing Emotional Trauma is an interdisciplinary book which explores our current understanding of the forces involved in both the creation and healing of emotional trauma. Through engaging conversations with pioneering clinicians and researchers, Daniela F. Sieff offers accessible yet substantial answers to questions such as: What is emotional trauma? What are the causes? What are its consequences? What does it mean to heal emotional trauma? and How can healing be achieved? These questions are addressed through three interrelated perspectives: psychotherapy, neurobiology and evolution. Psychotherapeutic perspectives take us inside the world of the unconscious mind and body to illuminate how emotional trauma distorts our relationships with ourselves and with other people (Donald Kalsched, Bruce Lloyd, Tina Stromsted, Marion Woodman). Neurobiological perspectives explore how trauma impacts the systems that mediate our emotional lives and well-being (Ellert Nijenhuis, Allan Schore, Daniel Siegel). And　evolutionary perspectives contextualise emotional trauma in terms of the legacy we have inherited from our distant ancestors (James Chisholm, Sarah Blaffer Hrdy, Randolph Nesse). Transforming lives affected by emotional trauma is possible, but it can be a difficult process. The insights shared in these lively and informativeconversations can support and facilitate that process.This book will therefore be a valuable resource for psychotherapists, psychologists, counsellors and other mental health professionals in practice and training, and also for members of the general public who are endeavouring to find ways through their own emotional trauma. In addition, because emotional trauma often has its roots in childhood, this book will also be of interest and value to parents, teachers and anyone concerned with the care of children. "This is a treasure chest of diverse perspectives on trauma. We are treated to a satisfying mix of leading evolutionary thinkers, stellar neurobiological researchers and distinguished Jungian and other psychotherapists, all offering rich and in-depth insights on a subject that requires inter-disciplinary joined-up thinking. Most importantly, the interview style works, and Sieff’s sensitive question-posing and surefooted comments and editing make the reading easy, vibrant and always stimulating." - Graham Music is a Consultant Child and Adolescent Psychotherapists at the Tavistock and Portman Clinics in London, UK, and author of Nurturing Natures and The Good Life. 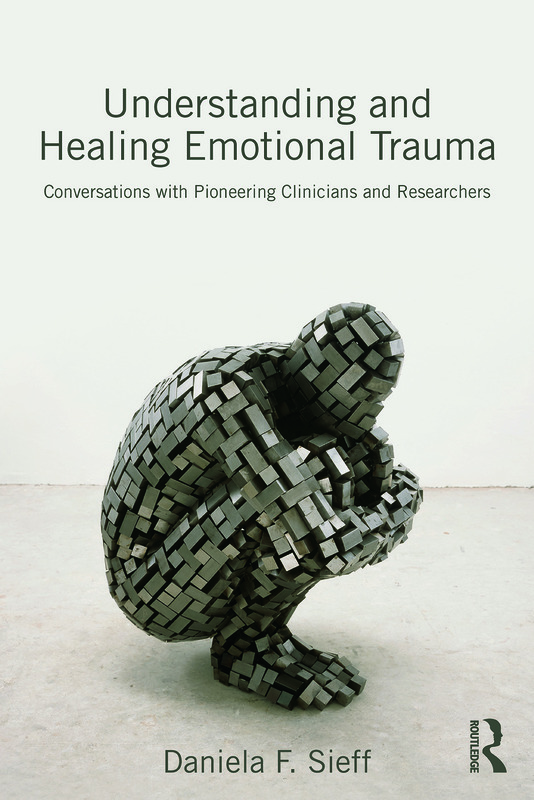 "This compelling collection of interviews with outstanding scholars and therapists of our day offers a creative and comprehensive understanding of trauma and its effects. Sieff’s book reveals her unique ability to distil the essence of the ideas of each of her subjects into a series of succinct but profound questions. She has shaped their replies into a book in which complex ideas concerning trauma are presented in an accessible conceptual frame. As such it will be of interest to many and a significant new resource for those who seek to integrate the best of the new thinking concerning trauma into their clinical practice." - Margaret Wilkinson, Jungian training analyst and author of Coming into Mind and Changing Minds in Therapy. "In my work with business leaders and leadership teams, in my own professional and private life, and in my role as a parent, I am continually reminded of the importance of emotional and psychological health. Daniela has made accessible the latest, fascinating thinking of the pioneers of trauma and healing. I highly recommend 'Understanding and Healing Emotional Trauma' to all those seeking a deeper, yet practical and readable understanding of the process of healing trauma to create emotional well-being – whether for their work, or for their personal lives." - Michael Rennie, Global Leader, Organisation, People and Leadership Practice, McKinsey & Co Management Consultants. Acknowledgements. Sieff, Introduction. Part I: Psychodynamic Perspectives. Kalsched, Sieff, Uncovering the Secrets of the Traumatised Psyche: The Life-saving Inner Protector who is also a Persecutor. Bruce Lloyd, Sieff, Return from Exile: Beyond Self-alienation, Shame and Addiction to Reconnect with Ourselves . Stromsted, Sieff, Dances of Psyche and Soma: Re-inhabiting the Body in the wake of Emotional Trauma. Woodman, Sieff, Spiralling Through the Apocalypse: Facing Death Mother to Claim Life. Part II: Neurobiological Perspectives. Nijenhuis, Sieff, The Selves Behind the Self: Trauma and Dissociation. Schore, Sieff, On the Same Wavelength: How our Emotional Brain is Shaped by Human Relationships. Siegel, Sieff, Beyond the Prison of Implicit Memory: The Mindful Path to Well-being. Part III: Evolutionary Perspectives.Chisholm, Sieff, Live Fast, Die Young: An Evolved Response to Hostile Environments? Blaffer Hrdy, Sieff, The Natural History of Mothers and Infants: An Evolutionary and Anthropological Perspective. Nesse, Sieff, Emotional Evolution: A Darwinian Understanding of Suffering and Wellbeing. Part IV: Concluding Perspective. Sieff, Connecting Conversations: Expanding our Understanding to Transform our Trauma-Worlds. Daniela F. Sieff is an independent writer and scholar, with a PhD in biological anthropology, and an active interest in the dynamics of the human psyche.